In a similar vein to the Education store, the Veterans and Military Purchase Program allows eligible users to buy products from Apple directly, with automatic discounts applied to the purchase. The discount is 10 percent off the usual price for the items, and applies to practically all items that can be bought online. Under the program, offers are provided to both current members of the military and veterans, and is also able to be used by immediate family members who also reside in the same household. Purchases must be made through the dedicated U.S. Veterans and Military storefront, or from any Apple retail outlet via an "in-store kiosk" which amounts to either an iMac that a store staffer will point the shopper to, or an iPad, store location depending. Apple notes the program is for personal use only, with limitations applied to the number of items that can be purchased or "sponsored" per customer. For example, per calendar year a user can buy up to three computer systems, iPads, unlocked iPhones, HomePods, Apple TVs, AirPods, and Apple Watch units, with a further limit of one Apple Watch Hermes model. The limit raises to ten each for the iPod touch, accessories including Beats products, certified refurbished items, and Designed by Apple in California books. Ten Apple Watch accessories can also be acquired, including bands and chargers, but again limited to just one Hermes band, and while ten third-party accessories can be bought, it excludes Microsoft, Bose, Adobe, and HP products. 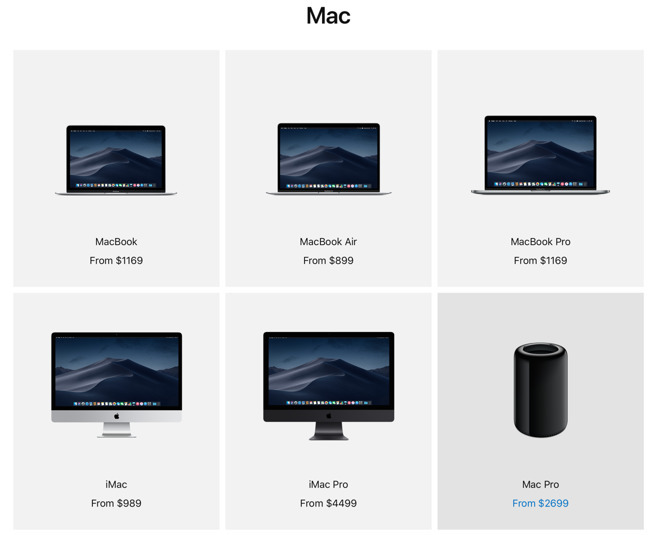 Up to three AppleCare+ or AppleCare protection plans can be bought for each applicable product line. The plans are also offered at a special pricing specifically for the store. "We are deeply grateful to the men and women of our armed forces," Apple said in a statement about the program provided to AppleInsider. "We are proud to offer active military and veterans a new dedicated online store with special pricing as an expression of our gratitude for their brave service." Military service verification is required prior to checkout in-store or online, according to Apple. The offering from Apple isn't the first of its kind from Apple, and is more of an extension of a previous program. However, there are often better deals available from other vendors by shopping at an authorized reseller. Retailers, such as B&H Photo, Adorama and even Amazon, are currently knocking double and even triple digits off new releases, as outlined in our holiday deal roundup and Apple Price Guide.